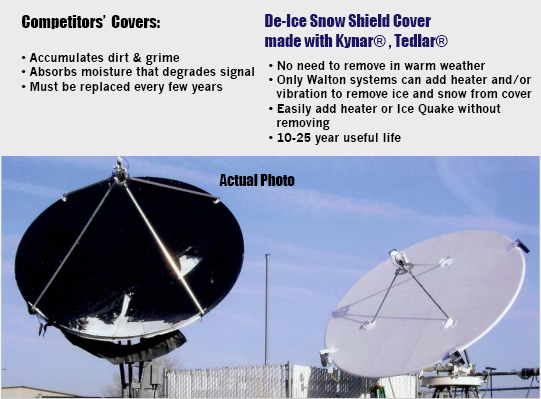 Walton De-Ice Kynar® Snow Shield’s construction versus CoverSat™ antenna cover construction. Information on CoverSat™ obtained on CoverSat ™ web site. 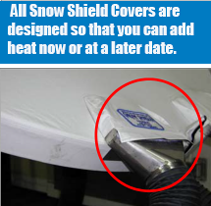 All PTFE and Kynar® Snow Shield Covers are manufactured with the same quality and care. 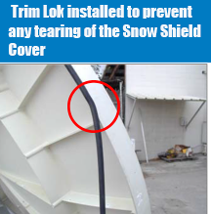 Both Snow Shield Covers also use the same hardware for installation onto the antenna reflector. Competitor’s Anti-Icing Systems can be very cumbersome to install during cold or wet days due to the lack of adhesion the tape would have on the back of the reflector. 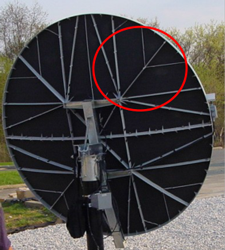 Older antenna reflector’s that have become “chalky” would also be difficult to adhere the tape to. 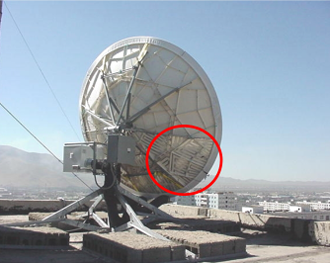 The tape is used to transfer the heat from the heat cable to the actual antenna reflector and is also used to hold the heat cable in place. 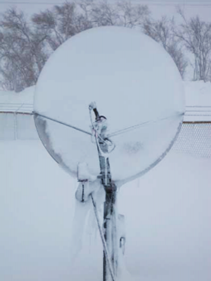 Some end users have found that anti-icing systems that are designed to be installed on 1/3 to 1/2 of the antenna reflector only melt the snow or ice on the portion of the antenna that it’s installed on. 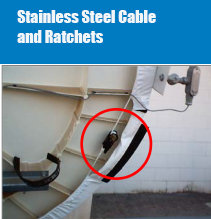 While other end users have found that the lack of insulation behind the heat cable allows the majority of the heat from the cable to simply be pulled away from the antenna reflector by a slight breeze. Competitor’s Anti-Icing System’s optional insulation kit can also be cumbersome to install during inclement weather conditions. 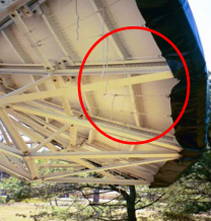 Many pieces are required on some antennas to complete the insulation’s installation with adhesives and metal clips required to hold the individual pieces in place. 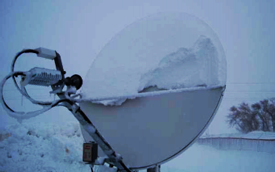 1.2 meter antenna with half reflector Ant-Icing system’s performance during a snow storm. Only 35 watts per square foot of power are used for this system. melt the snow and ice off of the lower half of the dish. Antenna is still off the air.